Mother Maria Skobtsova died on Good Friday, 1945, in Ravensbrck concentration camp near Berlin. 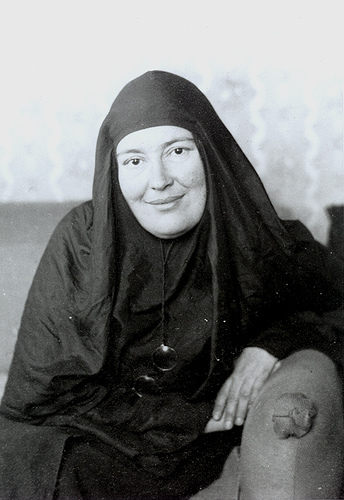 The "crime" of this Orthodox nun and Russian refugee was her effort to rescue Jews and others being pursued by the Nazis in her adopted city, Paris, where in 1932 she had founded a house of hospitality. Here is an extract from a lengthy essay, Types of Religious Lives , written in 1937 and discovered in 1996. The complete Russian text was published several months ago by the Paris-based journal, Vestnik , and is posted on the St. Philaret web site in Moscow at: www.glasnet.ru/~stphilaret/. The copyright of the English text is jointly held by Vestnik and the translator, Fr. Alvian Smirensky. Fr. Sergei Hackel has written a biography of Mother Maria: A Pearl of Great Price (St. Vladimir's Seminary Press). There are two types of love in the world: one that takes and one that gives. This is common to all types of love -- not only towards man. Each person can love a friend, family, children, scholarship, art, motherland, one's idea, oneself, and even God -- from either of these two points of view. Even those types of love which by common acknowledgment are of the highest category can carry this dual character. Take maternal love for example. A mother can often forget herself, sacrifice herself for her children. This does not as yet warrant recognition as Christian love for her children. One needs to ask the question: what is it that she loves in them? She may love her own reflection, her second youth, an expansion of her own "I" in other "I's" which become separated from the rest of the world's "we." She may love her own flesh and blood that she sees in them, traits of her own character, reflections of her tastes, the continuation of the family. Then it becomes unclear where is the principal difference between the egotistical self-love and a seemingly sacrificial love for her children, between "I" and "we." All this amounts to a passionate love of what is one's own, which restricts one's vision, forcing one to ignore the rest of the world, what is not one's own. Such a mother will imagine that the worthiness of her own child is incomparable with the worthiness of other children, that his mishaps and illnesses are more severe than those of others and finally, that at times the well-being and success of other children can be sacrificed for the sake of the well-being and success of one's own. She will think that the whole world (herself included) are called to serve her child, feed him, quench his thirst, train him, make smooth all paths before him, deflect all obstacles and all rivals. This is a symptom of a passionate maternal love. Only that maternal love is truly Christian which sees in her child a real image of God inherent not only in him but in all people, given to her in trust, as her responsibility, which she must develop and strengthen in him in preparation for the unavoidable life of sacrifice along the Christian path, for that cross-bearing challenge facing all Christians. With this kind of love the mother will be more aware of other children's misfortunes, she will be more attentive towards their neglect. Her relationship with the rest of humanity will be in Christ as the result of the presence of Christian love in her heart. This, of course, is the most radical example. There is no doubt that the love towards every being is divided into these two types. One may passionately love one's motherland, working to make sure that she develops gloriously and victoriously, overcoming and destroying all her enemies. One can love her in the Christian manner, working to see that the image of Christ's truth is more and more evident within her. One can passionately love knowledge and art, aiming to see oneself expressed in them, to be proud about them. Or one can love them, being conscious of one's service, one's responsibility for the exercise of God's gifts in these spheres. One can love one's idea of life only because it is one's own -- and to oppose it, enviously and jealously, to all other ideas. Even in this one can see the gift granted to me by God in order for me to serve His eternal truth during my earthly sojourn. One can love life itself passionately and sacrificially. One can even reflect upon death in two ways. One can direct two ways of love towards God. One can see Him as the heavenly protector of mine or our earthly desires and passions. The other love will humbly and sacrificially offer one's small human soul into His hands. Other than the appellation -- love -- other than external similarities, these two expressions of love have nothing in common. In the light of this Christian love, what must be the ascetical challenge to man, what is this true asceticism which is inevitably called for by the very presence of spiritual life? Its measure is self-denying love for God and for our fellow man. But an asceticism which places one's own soul in the center of things, looking for its salvation, shielding it away from the world, narrowly moving towards a spiritual egocentrism and fearing to diminish oneself even by withholding love -- this is not Christian asceticism. What can be used to measure and define the types of human lives? What are their prototypes, their primary symbols, their boundaries? This is the way of Godmanhood, Christ's path upon the earth. The Word became flesh, God became incarnate, born in a Bethlehem stable. This alone should have been fully sufficient to speak of the boundless, sacrificing, self-denying and self-disparaging love of Christ. Everything else is present in this. The Son of Man humbled His whole self, His whole divinity, His whole Divine nature and His whole Divine hypostasis beneath the arches of the Bethlehem cave. There are neither two Gods nor two Christs -- one who abides in blessedness within the bosom of the Holy Trinity and another, who assumed the image of a servant. The Only Son of God, the Logos, became Man, lowering Himself to humanity. His later activity -- preaching, miracles, prophesy, healing, enduring hunger and thirst, suffering Pilate's judgement, going the way of the cross to Golgotha and death -- all this is the path of His humbled humanity and along with Him the condescension of the Godhead to humanity. What was Christ's love like? Did it withhold anything? Did it take note of or measure its spiritual gifts? What did it regret, where was it ever stingy? Christ's humanity was spit upon, struck, crucified. Christ's Divinity was fully incarnate to the end in his spit-upon, battered, degraded and crucified Humanity. The Cross -- an instrument of shameful death -- became a symbol of self-denying love for the world. And at no time nor place -- from Bethlehem to Golgotha, neither in sermons nor parables, neither in the miracles performed -- did Christ ever give any indication allowing one to think that he does not completely and fully, sacrifice Himself for the world's salvation, that He had some reservation, some Holy of Holiness which He would not want to nor need to offer. He offered His own Holy of Holies, His own Divinity, for the sins of the world, and this is precisely where lies His Divine and perfect love in its fullness. This is the only conclusion we can come to from the whole of Christ's earthly ministry. But can the power of such love be Divine because God, in offering Himself, remains God, that is, He does not empty himself, does not perish in this fearsome sacrificial dissipation? Human love cannot be completely determined by the laws of Divine love because along this path man can become devastated and lose sight of what is important: the salvation of his soul. But here one need only to be attentive to what He taught us. He said: "If any man would come after me, let him deny himself, and take up his cross." Self-denial is important, without which one cannot follow Him, without which there is no Christianity. Withhold nothing, lay aside not only material wealth but also spiritual wealth, changing everything into Christ's love, taking it up as one's cross. He also spoke -- not about Himself and not about His perfect love, but about the love which human imperfection can assume. "Greater love has no man than the one who lays down his soul for his friends." How miserly and greedy it is to understand the word "soul" here as "life." Christ spoke here precisely about the soul, about giving up one's inner life, about the complete and unconditional self-sacrifice as the example of the obligations of Christian love. Here again is no place for the harboring of one's spiritual treasures, here everything is given up. His disciples likewise followed in His path. This is quite clear, in an almost paradoxical expression by Apostle Paul: "I wanted to be estranged from Christ to see my brothers saved." He said this, having stated that "It is no longer I who live but Christ who lives in me." For him such an estrangement from Christ is an estrangement from life not only in the transient, worldly sense of the word, but from the eternal and incorruptible life of the age to come. There are enough such examples to let us know where Christianity leads us. Truly, love here does not seek its own, even if this be the salvation of one's own soul. This love takes everything from us, deprives us of everything, as if ravaging us. Where does it lead? To spiritual poverty. In the Beatitudes we are promised blessedness for being poor in spirit. This precept is so far removed from human understanding that some attempt to read the word "spirit" as a later interpolation and explain these words as a call for material poverty and a rejection of earthly benefits. Others almost fall into a fanaticism, understanding this as a call for intellectual poverty, a rejection of thought and of any kind of intellectual substance. How simply and clearly are these words interpreted in the context of other Evangelical texts. The poor in spirit is the one who lays down his soul for his friends, offering this spirit out of love, not withholding his spiritual treasures.